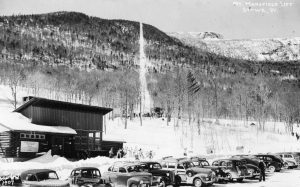 What is the record snow depth set in the 1968-69 season at the Mount Mansfield stake? The lift attendants manage every lift line at the resort with the call of “front row!” What ski area is it? 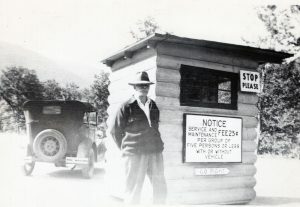 In 1941 the state of Vermont started charging Stowe skiers to park in the Mansfield lot. What did the state charge for parking? Bonus points for the year the state stopped charging! 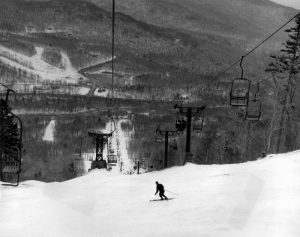 What new lift did Stowe install for the 1968-69 season? This year’s FIS Alpine World Cup Finals are this week in Andorra, wherever that is?. Mikaela Shiffrin took a lot of the drama out of the weekend by wrapping up her third consecutive overall World Cup in advance of the finals. About the only suspense for Mikaela this weekend is to clinch the GS World Cup which she has announced she wants. She has a significant lead and barring an uncharacteristic finish in the final GS, she should achieve that goal. Her situation is not unlike the situation Karl Schranz found himself in 50 years ago as he went to the 1969 World Cup finals having already clinched the overall World Cup. So where were those finals in March of 1969? They were held at Waterville Valley in New Hampshire! 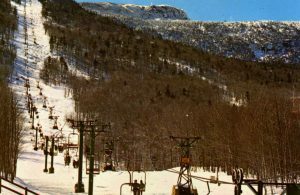 Waterville Valley opened for my junior year in college (1966-67). 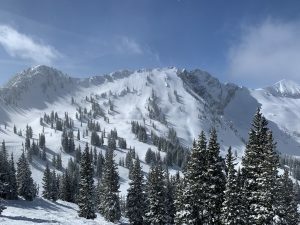 Actually, there had been a small ski area there before that, but Tom Corcoran who had previously managed Aspen saw its potential and developed a major ski resort. 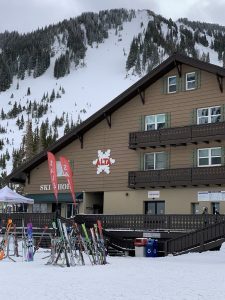 Everything was new so it became a favorite place for us college students to ski. 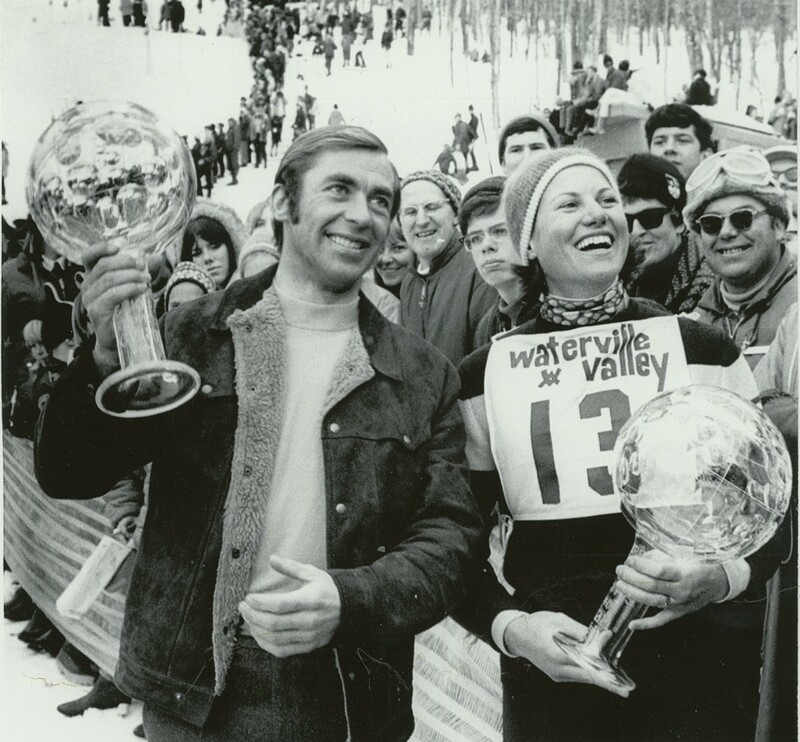 Tom Corcoran had been an international ski racer for the United States so right from the beginning he made sure Waterville Valley supported racing. They hosted many ski races of regional, national, and even international stature. That meant they needed gate keepers regularly and relied on college students like me to meet the need in exchange for free skiing. So in the winter of 1968-69 I was no longer in college, but working at IBM. When I found out the World Cup finals were going to be in Waterville Valley, I had my friends who were still in college sign me up to gate tend. There was one complication since I had burned a lot of my 10 vacation days on the ski trip to Aspen and Vail. No problem, I just called in sick when the day came. Hopefully my first manager at IBM doesn’t read this column! I helped with the men’s GS and slalom. It was great to see the big names of the day up close and personal. In fact, I got coached on how to rake the rut on my slalom gate by none other than Billy Kidd. The American women did very well at Waterville that weekend. Kiki Cutter won the slalom with Judy Nagel finishing third. Marilyn Cochran and Karen Budge tied for second in the GS. Marilyn actually won the GS discipline for that season however they didn’t give out crystal globes to the discipline winners like they do today. As mentioned, the men’s overall World Cup went to Karl Schranz. 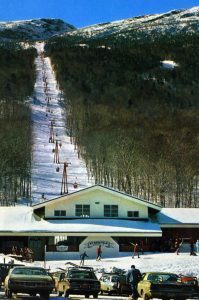 The women’s overall was decided at the finals in Waterville Valley. Twenty year old Gertrud Gabl of Austria and daughter of long-time Stowe ski instructor Pepi Gabl had a lead for the overall with only one competitor who could possibly overtake her, Wiltrud Drexel. If Drexel could win the slalom at Waterville, she could beat out Gabl. Gabl helped Drexel out by DSQing in the Waterville slalom, but Drexel finished well down in the results giving the cup to Gabl. By the way, the 1969 World Cup globe that was presented to Karl Schranz at Waterville is still on display at the Vermont Ski and Snowboard Museum. You may remember the circuitous story of how that cup ended up in a Hinesburg barn!! Where were the FIS Alpine World Cup finals held for the 1968-69 season? 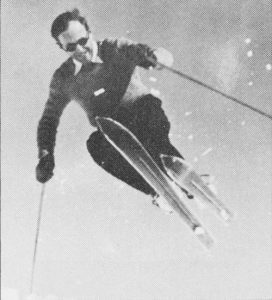 I grew up in Conway, New Hampshire, which became a center of skiing thanks to Hannes Schneider and Harvey Dow Gibson. Now I live in Stowe and there are a lot of parallels between the two towns. Both became nationally recognized ski resorts thanks to Austrian ski instructors backed by American financiers. 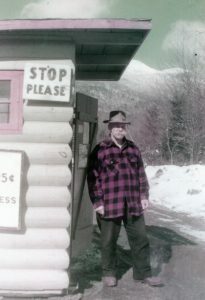 In Stowe’s case the Austrian was Sepp Ruschp and the financier was C.V. Starr. Sepp Ruschp was born in Linz, Austria, on November 17, 1908. His uncle introduced him to skiing when Sepp was 10 years old. Sepp took lessons from the Hannes Schneider Ski School in St Anton and was a quick learner. He soon got involved in competitive skiing which in those days included cross country, ski jumping, downhill, and eventually slalom. Being a natural athlete, Sepp excelled across all the disciplines. Sepp completed his education in Mechanical Engineering and in 1931 landed a job with the Steyer automobile company. However due to the economic instability in Austria, Sepp was soon laid off. He continued to ski race and began studying to become a professional ski instructor. To become a certified ski instructor in Austria required passing an examination that included knowledge of skiing, mountaineering, first aid, and teaching skiing. The exam was administered by specialists in each of the categories. Only about 25% of those who would take the exam passed. When Sepp took the exam, the teaching skiing examiner was none other than Hannes Schneider. Sepp passed the exam. Sepp’s competitive success drew the attention of a sports equipment company who hired him to be manager of the sports department in their Linz store. Recognizing that he needed more education related to his new job, Sepp took night classes to get the equivalent of a Business Administration degree. 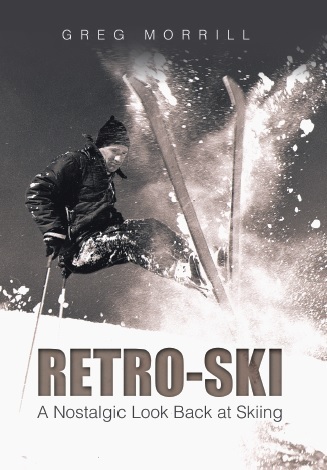 In 1934 after the Austrian national championships, the head of the Austrian Ski Association told the competitors that he had received a letter from the United States Ski Association with a list of ski clubs in the United States who were looking for ski instructors. Hitler was on the rise and Austria was in a difficult position. 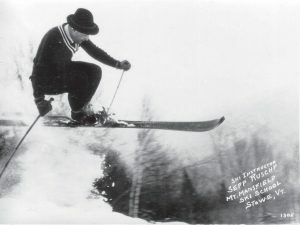 Sepp saw the opportunity to escape the uncertainty of Austria by coming to the United States to be a ski instructor. Sepp would write letters to 90 ski clubs in the United States! He enlisted a tutor in English to help him write the letters and to help him understand the responses. He got responses from Colorado Springs, Mount Hood, Mount Ranier, and of course, the Mount Mansfield Ski Club! The back-and- forth letter writing in those days took a while since it went by ship. Eventually Sepp was able to strike an agreement with Frank Griffin and the MMSC. Griffin had been able to line up coaching jobs with UVM and Norwich to sweeten the deal. It took another length of time to obtain a U.S. visa. On December 4, 1936, Sepp Ruschp set sail for the United States. He would arrive in New York City on December 10th and be greeted by a contingent of New York MMSC members. He took the overnight train to arrive in Burlington on December 11, 1936 where Frank Griffin would meet him and bring Sepp to Stowe. And as they say, the rest is history!